Yoko Ogawa shares the same elegant, pared-down aesthetic of Kazuo Ishiguro and/or Akira Yoshimura. Like them, she exerts remarkable control over her prose narrative. And, like them, the fact that something significant is occurring is not always immediately apparent. 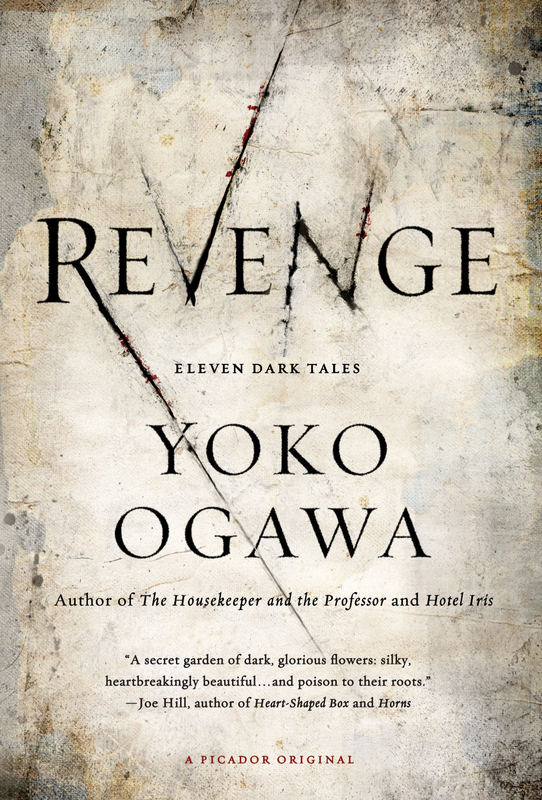 Revenge: Eleven Dark Tales provides eleven intimate encounters with love, loss, desire and, yes, revenge. The violence committed by Ogawa’s characters is particularly chilling, often presented as an afterthought. The situations into which the reader is pulled are eerily familiar, like in dreams. The stories are imbued with a sense of artistry. Afternoon at the Bakery begins with a woman waiting at the counter of an empty bakery to purchase strawberry shortcakes for her son’s birthday. An elderly woman wanders in and sits beside her. They trade small-talk, and in the course of their conversation it is revealed – very matter of factly – that the birthday boy is dead. He suffocated (perhaps years ago?) playing in an abandoned refrigerator. The elderly woman sympathizes and then she leaves, promising to send back the baker if she should see her. The mother continues to wait, seemingly with unlimited patience. Eventually she notices the baker in the kitchen, clutching a phone and crying. She wonders at the cause of the girl’s tears but decides not to interrupt. People passed by the shop window – young couples, old men, tourists, a policeman on patrol – but no one seemed interested in the bakery. The woman turned to look out at the square, and ran her fingers through her wavy white hair. Whenever she moved in her seat, she gave off an odd smell; the scent of medicinal herbs and overripe fruit mingled with the vinyl of her apron. It reminded me of when I was a child, and the smell of the little greenhouse in the garden where my father used to raise orchids. I was strictly forbidden to open the door; but once, without permission, I did. The scent of orchids was not at all disagreeable, and this pleasant association made me like the old woman. On first reading, that may sound a little too simplistic of a plot. The author is using a classic bait and switch scenario – pull a reader into a seemingly average, everyday situation and then draw back the veil. She keeps the action and revelations balanced on the edge of what is possible. Ogawa performs this trick over-and-over-again throughout the collection, yet the novelty never diminishes. And even when things begin to feel unsteady, she uses the (authentic) emotions of her eleven narrators to steady us. Every story is told through the first person, introducing a new storyteller who brings a new set of emotions, responses and perspective to events. So one woman’s confessor becomes another man’s creepy uncle. These tales are linked together by a delicate cord of tenuous relationships. As the book progresses the number of connections grows and the cord becomes a net. Part of the fascination of Revenge is derived from the joint discoveries of what the next connection will be and where it will occur. A woman who wears her heart outside her chest, a surgeon’s jealous lover, a black-sheep uncle, a college student’s patroness, that crazy neighbor you made the mistake of talking to once… Ogawa binds the macabre and the mundane with brilliant results. She and her translator Stephen Snyder make it look easy – allowing the action to move at its own, languid, pace. Together they are carefully constructing prose environments, emotional tableaux, frozen in time like the scene in a Vermeer painting. 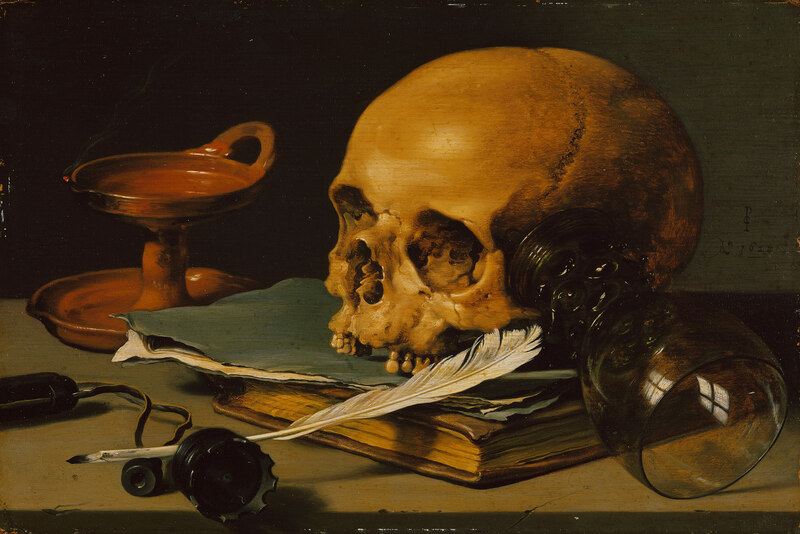 Or like Pieter Claesz’s Still Life with a Skull and a Writing Quill. It’s been a favorite of mine since college. The artist has thrown together an assortment of mostly common, everyday items – except for the skull. And it is that one disparate element which sets the tone and defines the viewers response. Claesz was a 17th century “Haarlem painter who gave extraordinary presence to familiar things” . It’s the gift given to every true artist: that ability to draw back the veil and show the rest of us what is not always immediately apparent.